Parents are natural worriers. There is some sort of chemical change that happens as soon as your first child is born that transforms your brain so that it is constantly worrying about something. And for me I’m usually worrying about money. Even though my girls are only two I’ve already begun to worry about funding college, trust funds, etc. 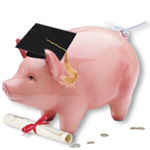 If you’re in the same boat (for your sake I hope you’re not) you’ll be happy to know that FinAid.org has a great Parent’s Guide to Financial Aid with step-by-step instruction on how you should proceed with plans for paying for college. There are tons of links, tools, and guides for everything from a College Cost Projector to information on Education Tax Credits. And they’ve even got a guide for parents of newborns and younger children. It’s never too early to start saving, right? As a parent with 3 children who have left the home and 2 still here, may I offer some counsel to you who are just starting out? Sit down now, and decide what you will do in regards to your finances; before you know it, your children are grown and gone! Start today with some sort of savings fund for them, and STICK to it! Be persistant! Be united! Be smart! Start small at first, but start.